The 101st Illinois General Assembly takes over January 9, 2019. There are more new legislators than ever before. 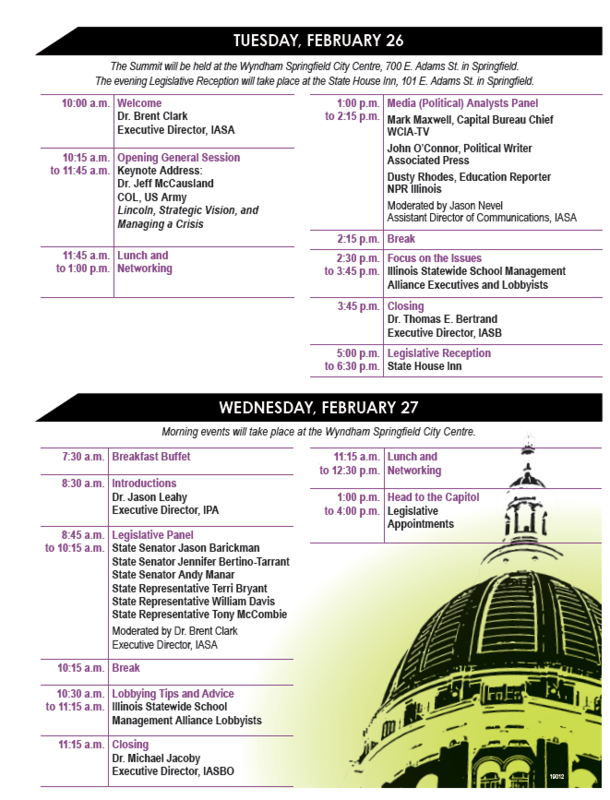 This is a perfect time to get acquainted with your local legislators and learn more about the critical education issues facing lawmakers in this spring session. This is also an opportunity to emphasize the importance of advocating for increased evidence-based funding. Plan to take part in developing the school leadership strategy for public education and show the strength and unity of education stakeholders in carrying our message to the State Capitol at this critical time. Your presence here is important as we make our voice heard on all education issues. To register, click on the Register Now button on this page. A special thank you to PMA Financial Network, Inc./Forecast5 and Stifel for cosponsoring the Summit! Ideally, district representatives would include the superintendent, one board member, one principal, and one business official but any combination is welcome. District Superintendents will be responsible for registering the team. Event Registration Fee: $165 per person, includes registration and meals.